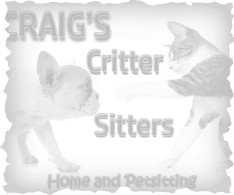 My name is Craig Smith and I am the proud owner of Craig's Critter Sitters Home and Pet Sitting. I first started my business doing house cleaning and incorporating some pet sitting under Clean Concepts. With my back starting to hurt more and more, I decided that the house cleaning would have to cease. So I took my love for animals a bit further and opened up under Craig's Critter Sitters. As a kid I grew up with cats, birds, and fish and know the extent of care they need. I have a beautiful Chihuahua named Charlie pictured above that I love and take care of everyday. I feel with my vast knowledge, and of my co-workers, I can take care of your furry, feathery, or scaly friends. Large or small, we do it all!